Sunday’s round of fixtures gave us the chance to see probably the two most impressive sides from the first round of results against each other when Newell’s Old Boys hosted Lanus in Rosario. It was Lanus who once again produced a great performance of quick attacking football as they eased to a 3 – 0 win. River Plate also managed to make it two wins out of two with a win at home over Estudiantes courtesy of a David Trezeguet goal. Boca‘s indifferent start to the season continued but it was not their defence that caused the problems here rather the lack of any goal threat in what was a very dull game. In the other game, Quilmes finally won after a run of eight games and the heartbreaking defeat in La Bombonera last week. ALL THE GOALS AND REPORTS HERE…. After Lanus’s impressive 4 – 0 demolition of Colon and Newell’s 3 – 1 away win at Independiente last week this was an early opportunity to see two of the stronger outfits in the division. Although perhaps more even matched than the scoreline would suggest it was Lanus who once again stole the headlines. The front 3 for Lanus this year are going to cause a lot of teams problems and will score goals and it wasn’t too long before the pace and movement of Silvio Romero opened the scoring in this game. He latched onto a through ball before cooly rounding the keeper and slotting home. Just before half time, Lanus doubled their advantage when a free kick was unfortunately bundled into his own net by Newell’s defender Marcos Caceres. 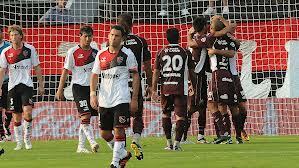 The second half was only a few minutes old when Lanus were awarded a penalty and Mario Regueiro made no mistake. Lanus are the team to beat in these early stages and without the distraction of the Copa Libertadores could they be serious contenders for the championship? Despite not playing the best football in the league at the moment River Plate continued their fine start to the season with a second win. Estudiantes woeful performance last week in defeat to Tigre needed a response and although there was a slight improvement in the level of performance they still are without a win. The only goal of the game came in the 32nd minute when David Trezeguet volleyed home a cross from the left. Good news for River but worrying signs for Estudiantes and manager, Diego Cagna. Quilmes finally got the win that had eluded them in the previous 8 outings and after last week we saw some more impressive long range shooting. No better example of this was Quilmes’s opening goal when after just 7 minutes Juan Manuel Cobo hit a fierce, swerving shot that left All Boys keeper, Nicolas Cambiasso rooted to the spot. A second goal from Jacobo Mansilla was enough to seal the win despite a late consolation from Oscar Ahumada. Things may have been a little more nervy but not long after getting this life line All Boys were reduced to 10 men when Maxi Coronel was shown a second yellow card. The pre-match build up was perhaps more interesting than the actual game in Tigre. The summer saw Tigre enter lengthy discussions with Boca legend Juan Roman Riquelme only for the number 10 to have a chnage of heart and resign for his beloved Boca. He didn’t feature in the game due to months of inactivity and lacking match fitness but it created a nice talking point pre-game. Carlos Bianchi made several changes to the side that scrapped past Quilmes last week and then lost to Toluca in the Copa Libertadores. Having seen his side defend so badly in the previous two matches Bianchi will have been pleased that his side here kept a clean sheet. However, they offered nothing going forward so a balance needs to made if Boca are to challenge domestically and in the Libertadores.